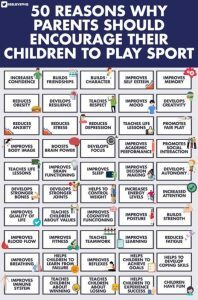 The WHO (2010) recommendations for children can be found here. 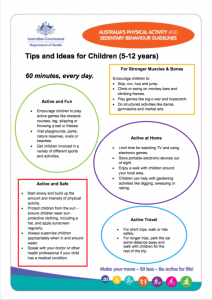 Physical Activity Recommendations – Have fun! 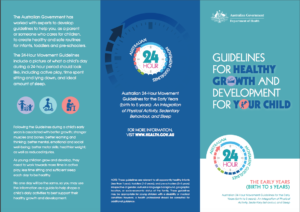 Note: Although meeting the physical activity recommendations, the Australian Government also provides recommendations on sedentary behaviour and sleep. 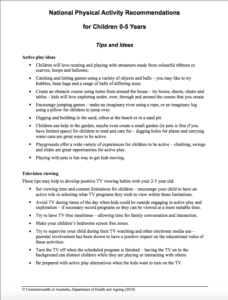 Should not spend any time watching television or using other electronic media (DVDs, computer and other electronic games) and instead, when sedentary, the caregiver is encouraged to engage with them through activities such as reading, singing, puzzles and storytelling. Play with different sized balls. Play with balloons – punch, kick or throw them to keep them off the ground. Blow bubbles and chase them through the air. 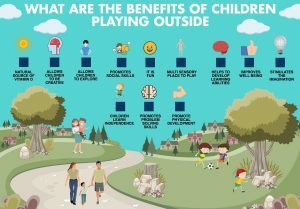 Play games – try hide-and-seek, obstacle courses, follow the leader, stuck in the mud, or tip/tag games. Walk barefoot on different surfaces – try grass, carpet, concrete or sand. Pretend to move like different animals. Play dress ups and act out different roles. 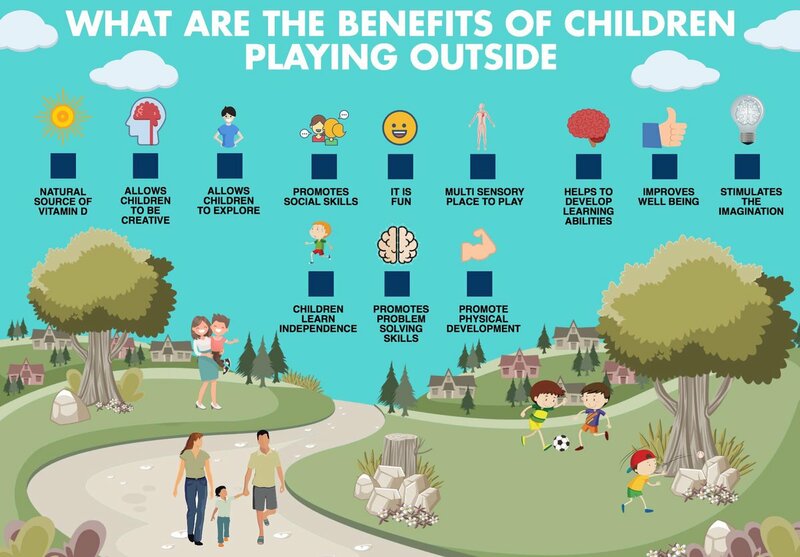 Walk to places rather than driving or using the stroller. Should not be restrained for more than 1 hour at a time (e.g. in a stroller, car seat or high chair) or sit for extended periods. For those toddlers younger than 2 years, screen time is not recommended during sedentary periods. For those aged 2 years, screen time should be no more than 1 hour in total throughout the 24-hour period- less is better. 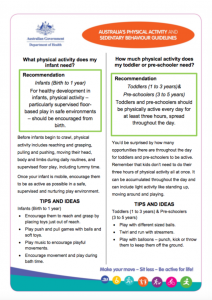 When toddlers are sedentary, the caregiver is encouraged to engage with them through activities such as reading, singing, puzzles and storytelling. Should not be restrained for more than 1 hour at a time e.g. in a stroller or car seat) or sitting for extended periods. When pre-schoolers are sedentary, caregivers are encouraged to engage with them through activities such as reading, singing, puzzles and storytelling. 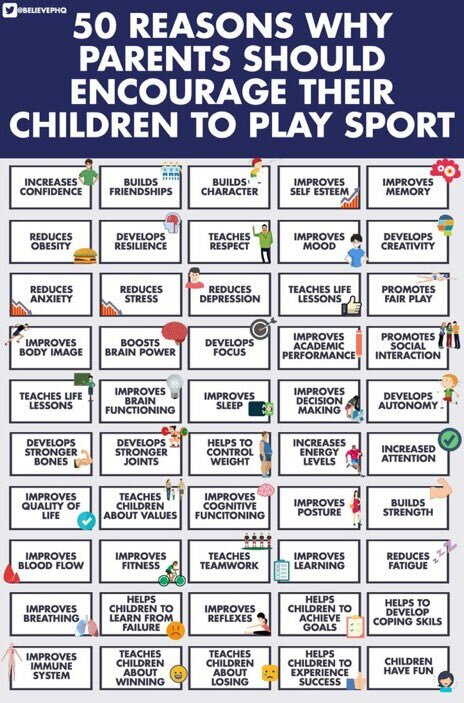 Physical activity for children 5-12 years provides social benefits, emotional and intellectual benefits & health benefits. It should involve moving more and sitting less! 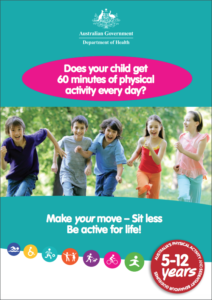 Remember, not all the physical activity needs to be completed all in one go. The 60 minutes can be accumulated throughout the day. However, it should be of moderate-vigorous intensity. Note: As with 0-5 years, the Australian Government also provides recommendations on sedentary behaviour and sleep. 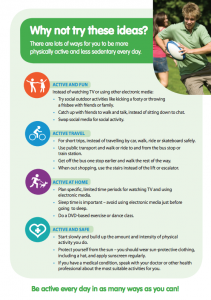 Note: As with 5-12 years, the Australian Government also provides recommendations on sedentary behaviour.